Anaplan is a robust and comprehensive organizational planning platform that covers single usages and enterprise-wide processes. This allows big companies and institutions to connect the different aspects of their businesses from data and plans to people. With Anaplan, organizations can look forward to information that enables them to make intelligent decisions. This is because the software analyzes performance data that managers can employ moving forward. Moreover, Anaplan makes decision-making collaborative. 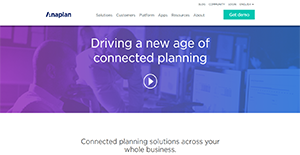 The planning solution lets users work together securely and with ease. This makes the process a faster one and also makes certain that everyone involved is on-board with the resolution to a particular issue. Managers are wont to ask the question, “What should we do from here on?” when presented with performance data from the past. That is why Anaplan provides them with tools they can utilize in evaluating potential moves before acting on them. This way, they are truly armed with useful information every time they make an action that can ripple across the organization. Plans and decisions are better done when more heads than one are working together. Anaplan understands this, which is why the platform is designed so that all stakeholders can access the same data, modify information and sync them across the board, safely perform their tasks in the cloud. Hyperblock is the term that is used to refer to Anaplan’s proprietary modeling and calculation engine. This powerful tool affords users the ability to design complex models that employ data from all over the organization to come up with data that can influence impactful decisions. Anaplan is designed in a way that it is both intuitive and user-friendly. This lets people with little technical know-how to operate the solution with ease, especially when it comes to modelling and daily task performance. This allows for a smooth workflow and also decreases the reliance on IT support. If you are interested in Anaplan it may also be sensible to check out other subcategories of Best Business Process Management Software gathered in our database of B2B software reviews. It's important to keep in mind that virtually no service in the Business Process Management Software category is an ideal solution that can fulfill all the goals of different business types, sizes and industries. It may be a good idea to read a few Anaplan reviews first as certain solutions can excel just in a very narrow set of applications or be prepared with a really specific industry in mind. Others can work with an idea of being simple and intuitive and consequently lack complex functions welcomed by more experienced users. You can also find services that cater to a broad group of customers and provide a complex feature base, however that in most cases comes at a more significant cost of such a service. Ensure you're aware of your requirements so that you choose a solution that provides specifically the elements you search for. How Much Does Anaplan Cost? Anaplan’s SMB and enterprise pricing information is available only upon request. Contact the company for more details, and ask for your quote. We realize that when you make a decision to buy Business Process Management Software it’s important not only to see how experts evaluate it in their reviews, but also to find out if the real people and companies that buy it are actually satisfied with the product. That’s why we’ve created our behavior-based Customer Satisfaction Algorithm™ that gathers customer reviews, comments and Anaplan reviews across a wide range of social media sites. The data is then presented in an easy to digest form showing how many people had positive and negative experience with Anaplan. With that information at hand you should be equipped to make an informed buying decision that you won’t regret. What are Anaplan pricing details? What integrations are available for Anaplan? Anaplan is an open API system, and enables organizations to create custom connections with their favorite applications. For more information, contact support through phone or email. If you need more information about Anaplan or you simply have a question let us know what you need and we’ll forward your request directly to the vendor.